The Ainsworth Funeral Home is conveniently located within the center of the village of Wellington, one block north of Main Street, at 288 Noxon St, Wellington. Our parking lot and ample on-street parking provides easy access to our building. 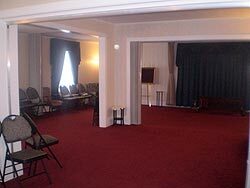 The funeral home is well suited for visitations with a cozy homelike setting. Our facility is comfortable and spacious enough for larger services while offering a warm inviting atmosphere for smaller gatherings and visitations.